This article appeared in Architectural Review Asia Pacific #126: Architecture and Infrastructure. 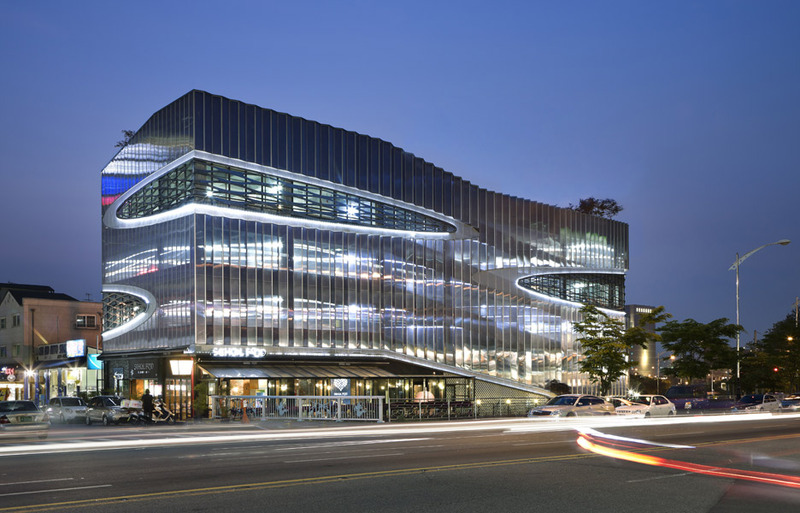 Herma Parking Building is located in the subcentre of Yongin City, a new satellite city of Seoul. For new cities born through urban planning, demand forecasts seldom go wrong and only the occasional parking building fails to live up to its function. However, when they do, they become dark blots on the city, because, although seldom left unused, they can’t help but reveal their unsightly framework. The Herma Parking Building could have repeated this mistake as only 20 per cent of the total floor area was permitted for commercial use, meaning the project would likely not be profitable. 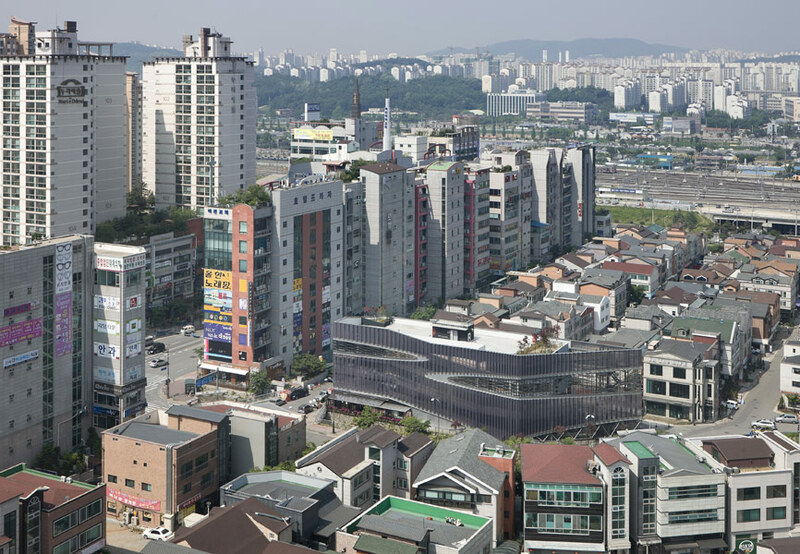 However, architect Jeong-Hoon Lee focused not on the limitation of the floor area but on the site location at the entrance of a popular local district, Cafe Street, and a stream running along the front of the parcel. His solution was a parking building that doesn’t actually look like one, emphasising exterior design rather than minimum structural requirements. In effect, he wanted to catch two hares, securing both profitability and aesthetic effect in the downtown area by combining an icon with a very functional building. Parking buildings don’t need insulation, which allowed Lee to conduct various experiments in materials and construction. 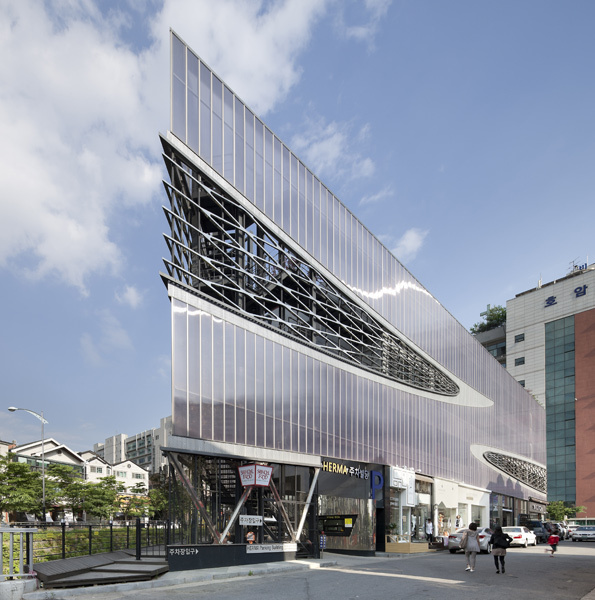 For the facade, he chose five-layered polycarbonate, coating the inside white and the outside purple, with IR and UV coating increasing the light diffraction. As a result, according to the viewing angle, the facade seems to show through and sometimes has an opaque purple elevation. Dependent on sunlight or night-time illumination, it displays totally different colours and elevation effects. Lee designed the folded angles of polycarbonate at anywhere from 60 to 150 degrees, so the slightly differing angles of elevation create a rhythmical flow with the speed of the vehicles on the road. For Lee, “polycarbonate was the perfect neutral material, as the blurriness of the material reflects the rapid speed of the city”. Meanwhile, the polycarbonate panels on the rear side, facing the downtown buildings, don’t have any angles, a strategy intended to harmonise with the rigidness of the back street. The building also features streamlined openings that cut across the elevation, inspired by automobile radiator grilles and offering natural ventilation. They’re also designed for views to the outside at different heights and directions, and the size of the openings were dependent on the polycarbonate panels (12 metres was the maximum length that could be delivered to the site). 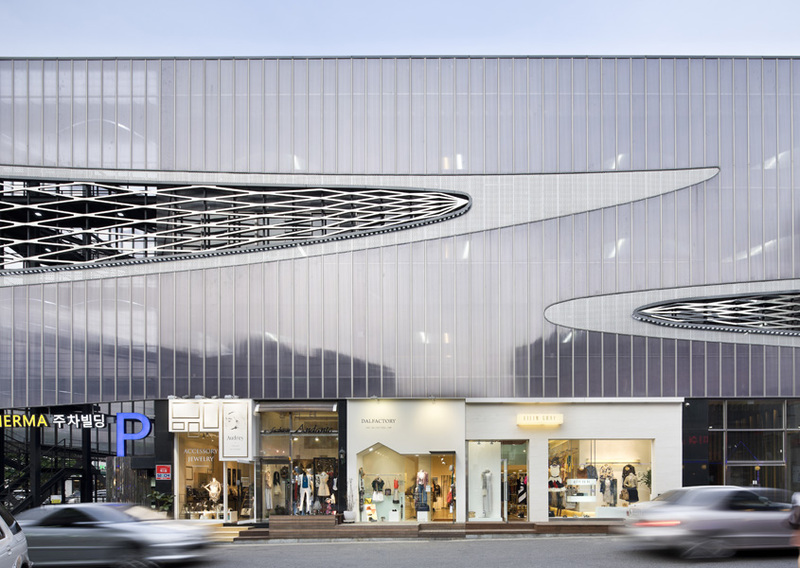 The openings are the ‘eye’, and also the ventilator and decorative ornament of the building, which is covered with a diamond-shaped pattern made of stainless steel. The diamond shapes change in size, with the slightly changing angles of the polycarbonate panels to create a geometric pattern, and as the angles of the polycarbonate panels change, the locations of the zinc-galvanised pipes supporting the polycarbonate panel vary slightly. Thus the diamonds change in size following the location of the zinc-galvanized pipes, a move requiring sophistication in order to meet the intersecting point of each corner of the diamond. The Herma experiment was limited to material and elevation, although the skin, free from the structure and function, maximised the visual impact of the building and thereby the dynamics of the downtown area. The balanced sense and judgement of the architect in experimenting with material that is low-priced, easy to fabricate and diverse in material properties was brought to bear in designing within the appropriate budget, while enhancing design impact. For Lee, working on the project gave him “a chance to think about the architect’s social responsibility,” even as the first consideration was to maximise the lease area by placing the terrace along the stream. 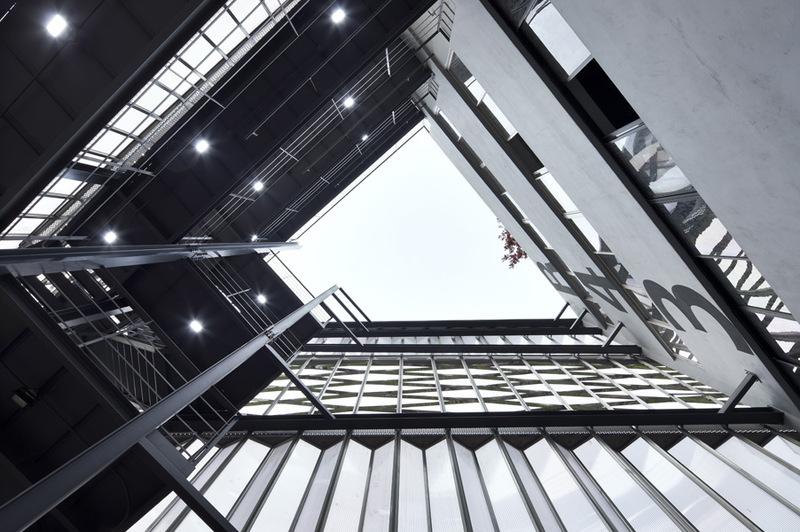 Herma is therefore set to become an iconic building, changing the perceptions of what a parking building can be, even a building that can influence its urban surrounds.